The Young Men Olympians organization was founded on September 3, 1884 as an all men’s benevolence club. At the start, the organization had about 30 members. Since then the club has evolved and grown drastically. Today it is still an all men’s club, but it now has six different divisions. They include the Body, the Furious Five, the Big Steppers, the First Division, the Untouchables, and the New Look Kids. The Body is the original YMO organization. Anyone from any of the other five divisions can parade with the Body as long as he is wearing black and white. For example, if a member of one of the other divisions decides the costs of parading with his division are too much, he can parade with The Body instead. Each of the divisions has a Grand Marshal, and there is a Head Grand Marshal who overlooks everyone in the organization and ensures that the parade runs smoothly. As explained by society board member Arnold Basquine, the five divisions came about when other men’s clubs wanted to join the Young Men Olympians organization (Arnold Basquine. “Young Men Olympians’ Costumes.” Personal interview. 16 Nov. 2012). If one of these divisions were to decide to become independent of YMO, the organization would then be open to taking on another men’s club. All of the divisions were independent clubs at one time, with the exception of the New Look Kids, and they kept their original club names when they joined the YMO. The club’s first president was George Thompson. Since then there have been five additional presidents throughout the years including Walter Payton, Clarence J. Adams, Spencer Coudray, Sr., Raymond Joseph, Jr., and Norman Dixon, Jr. Norman Dixon, Jr. is the current president and has been involved with the YMO for 42 years. Most of YMO’s members have been involved with the organization since they were children. The goal of YMO is to pass the tradition of second lining down from generation to generation. This is the reason for the recent addition of the New Look Kids division of the club. It currently has sixteen members, all of whom are from ages three to 18. According to Basquine, the members of YMO want to pass down the traditions to the children so that when they get too old, the kids can take over (Arnold Basquine. “Young Men Olympians’ Costumes.” Personal interview. 16 Nov. 2012). The Young Men Olympians has always been an Uptown club. 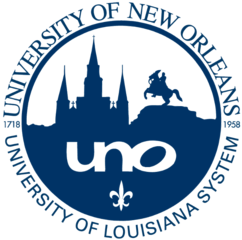 Since the time the club was founded, there has been a longstanding rivalry between all of the Uptown clubs and all of the Downtown clubs, with Canal Street being the dividing line. The YMO clubhouse is located on the corner of South Liberty Street and Josephine Street. This is the location of the start of the club’s parades. This is also where the leaders of the club hold meetings every first and third Sunday of the month. During these meetings, the president, Norman Dixon, Jr. and the vice-president, Wardell Gibson II, discuss any issues that pertain to how the club is run. If there are any issues, the leaders consult with some of the club’s oldest members to verify how things were run traditionally. Some of these members include Mr. Johnny, who has been involved for 70 years; Alfred Carter, who has been involved for 78 years; and Steve Solomon, who has been involved for 78 years. This year, Alfred Carter was nominated for the oldest second liner in the city and received a plaque commemorating all of the years he has spent second lining. Similarly, each year YMO gives a ball during which five or six members receive plaques commemorating their 30 and 50 year marks. On the first Sunday of every August the club elects new officials. After the officials have been elected, a priest says a prayer for all of them, making their new positions official. In addition to the elected officials, there is a judicial board of 23 members. The judicial board is consulted whenever any of the members violate the behavioral code. The board decides what type of penalty that member will face, whether it is a fine or just a warning. In addition to the second line parades YMO puts on, they have been involved in many other events. For example, when Ray Charles performed at the Fairmount Hotel in 2001, six members of the YMO performed a closeout for Charles’ performance. The club also travels to Fort Myers, Florida every year during Mardi Gras to perform in the casinos. Additionally, the YMO make appearances at Jazz Fest and Super Bowl parties each year. When Katrina hit, many of the members of the Young Men Olympians evacuated. Therefore, YMO did not have a parade that year, nor did most of the second line clubs, since there were no parades held that year from the time the storm hit until January. However, most of the clubs recovered after Katrina and still continue parading today. The Young Men Olympians club is no exception. Since the older members ensure that they pass their traditions down to their children, grandchildren, and nephews, there is no doubt that the Young Men Olympians will carry on second lining for years to come. Every year, the six divisions of the Young Men Olympian Benevolent Association come out of their clubhouse in a different suit with different accessories. The process of making the accessories and choosing the suit for the second line in September begins in March when each division chooses their colors, with the exception of the Body which always second-lines wearing black and white. The Body is made up of YMO members who do not want to march with a particular division in any given year. Nonetheless, every year the other divisions of YMO pick new colors around which to pick a suit and create accessories. Members bring different color scheme ideas and the group picks one idea or sometimes combines different members’ ideas. When picking colors, the members also decide upon a theme around which they can create accessories and words that go along with the theme for that year. The words displayed on suits are normally a short phrase that communicates the theme and serves to tie together the tout ensemble. With two or three colors chosen, the division’s members collectively decide on shoes, hats and a two- or three piece suit. All of the members of the division must wear identical clothing that complements the colors of the theme that year. The next step in the process is the creation of accessories. There are several different types of accessories: the cane-stick, the basket, the fan, and the streamer. Each of these is decorated with bows, feathers, velvet or satin cloth, sequins, trim and/or embroidered words. The cane-stick, the basket and the fan are interchangeable. Usually a division will have one or maybe two of these decorated according to their colors and theme. The streamer is particularly important and usually every division always wears one. The streamer says the name of the division and the words that go along with the theme for that year. The men in the division construct and create nearly every aspect of their accessories. Each member is given a task to do (rolling ribbon to make bows, for example). From deciding upon a theme to stepping out of the door of the clubhouse, says Basquine, the process of choosing a theme, colors, suit, words in addition to the process of creating accessories takes from February to a couple of days before the second-line in September (Arnold Basquine. “Young Men Olympians’ Costumes.” Personal interview. 16 Nov. 2012). 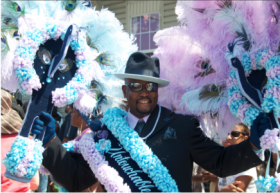 For example, the Untouchables division at the September 2012 second-line had the theme/words of “Pretty as a Peacock.” Their colors were powder blue, lavender and navy blue. Their accessories were a fan and cane-stick shaped in the form of a peacock with lavender and blue feathers for plumage. In addition to navy blue suits, the bottom piece of the streamer had another peacock with the words “Pretty as a” above the likeness of the peacock. Entrance into the Young Men Olympians can occur at different times in a man’s life. Membership can follow him to his grave. When a member of the Young Men Olympians passes away, the organization offers funeral services to the family of the deceased member. The organization owns and maintains an above ground burial site at Lafayette Number Two which is located on Washington Avenue and bound by Saratoga St., Sixth St., and Loyola Avenue. It is believed that the organization’s tombs were owned by the city and sold to the organization in the recent past. Members are only buried at the Young Men Olympians’ gravesite if the deceased’s family agrees to it or if the family lacks a burial site of their own. The service is provided free of charge and all maintenance and ownership costs associated with the grave site are paid for by the organization. However, a recently passed rule requires that the deceased member’s dues be completely paid before his burial. In addition, if he is to be buried at the Young Men Olympian grave site he must be dressed in the organization’s colors, black and white. Once a decision is made regarding the location of the member’s burial, a funeral service is carried out by various members of the organization. Regardless of whether the deceased member is buried at Lafayette Number Two or another cemetery, the organization carries out a burial ceremony that has existed since the Young Men Olympians’ formation. Group members carry out a progression for the deceased accompanied by a brass band. The slow dirge starts at their clubhouse and follows behind a hearse carrying the body. When the progression is half a block away from the cemetery entrance a sad sounding song is played by the band as the members drag their feet in unison, following the lead of those in front of them. However, according to Basquine, while the dance steps are done in unison, members still find ways to personalize it. Some members will dip down lower with each step while others may exaggerate their steps to add a personal flare to their movement (Arnold Basquine. “Young Men Olympians’ Costumes.” Personal interview. 16 Nov. 2012). Once the members reach the grave site the music stops and they “cut the body loose.” The casket is removed from the hearse and lifted up towards heaven three times by pall bearers. The name of the dead member is said each time the body is lifted upwards as a manner of communicating to those watching that the late member is bound for heaven. Afterwards, the casket is placed in the grave. However, if the body is to be buried at a cemetery that is not Lafayette Number Two, they will cut it loose in the street and return it to the hearse before it is driven to its final destination. Once the body has been cut loose the members slowly exit the cemetery with their fezzes off, repeating their slow mournful dance. The mood of the ceremony changes once the members leave the cemetery or the hearse drives away. The band changes it’s music to a song with a more upbeat tempo and the members second line back to their clubhouse. Just as the Young Men Olympians follow a customary way of delivering their dead to the cemetery, they also dress a specific way during their funeral services. During the funeral progressions members primarily wear black fezzes while grand marshals wear white fezzes. The fezzes are worn exclusively by the adults and are used to display the logo of the organization. Their funeral outfits are composed of black pants, black jackets and white shirts. A purple and black reversible patch is often attached to the jackets of the members. The black side of the patch is reserved exclusively for funerals and anniversaries, while the purple side is worn for all other occasions. The unique style of dance and music associated with the Young Men Olympians’ is not only reserved for occasions of death within the organization. Every year the organization celebrates its anniversary during the 4th Sunday in September with a parade. While the parade features the traditionally upbeat music associated with second line performances when the organization passes Lafayette Number Two they pick up the slow somber dirge of their funeral marches. This change in dance occurs from the front of Saratoga and Washington and continues to the corner of Loyola and Washington. The organization has also been hired by Charbonnet Funeral Home to perform their unique dirge at a funeral home convention held in New Orleans and have been paid to participate in the Jazz funeral of famous musicians like Ray Charles. This content was originally published on October 29, 2012.